Rimini, (a.k.a “Miami of Europe”) is on the Adriatic coast of north-east Italy in the Emilia-Romagna region. It is the birthplace of film director Federico Fellini and one of the most famous European seaside resorts, with an amazing 15km-long sandy beach and plenty of hotels, restaurants, cafe and bars.. Today Rimini is best known for tourism, trade fairs and conferences. Rimini is also an extremely interesting city, full monuments and art. 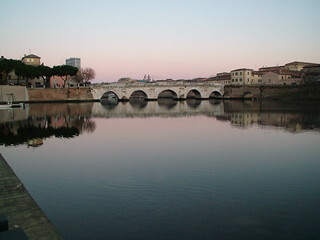 These include the Renaissance House of Malatesta, the Roman Tiberius Bridge and the Arch of Augustus. There is also evidence of Leonardo da Vinci having been both a frequent visitor and working locally during his most productive period. You should visit the 1747 Pescheria Vecchia on the left of the central Piazza, built on the basis of designs by Buonamici. There, artists and local market traders display their wares on the marble tables where fish was sold in antiquity. Cross the old town centre on Corso d’Augusto and enter the medieval district of San Giuliano where a labyrinth of narrow alleys will keep your sense of direction sharp. There, you may also get lucky and catch the street festival “Festa de Borg”. Nearby family attractions include the Rimini Dolphinarium and the “Italy in miniature” theme park. 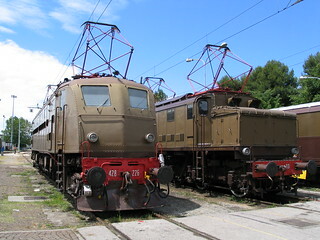 Drop by the main train station for some interesting looking locomotives. Day visits from Rimini can take in the ancient town of Ravenna along the coast, with the Basilica di San Vitale, Dante’s Tomb and several museums located between several churches classified as UNESCO World Heritage sites. 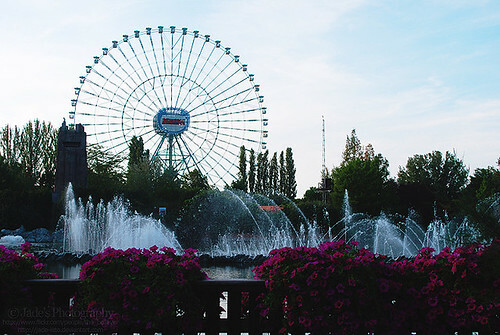 The Mirabilandia Amusement Park with its huge Eurowheel is a short distance away. The nearby charming fishing village of Cattolica is built around a small bay and stages an annual deep-sea fishing competition as well as music and dancing at its lovely squares. The Republic of San Marino, the oldest republic in the world is about 26km away from Rimini, has its own army, currency and postage stamps. San Marino’s interesting landmarks and historical attractions are all within easy walking distance.